Material--The iWatch Band Replacement Is Made of High Quality Zinc Alloy with Rose Gold Plated,Stylish and Elegant. Partial Function--The Jewelry Smart Watch Replacement Band Can Dress up Your Apple Watch Beautifully,Get Lots of Compliments on It. Length--It Fit Wrist Size 5.9" - 7.5" (150mm-197mm),With 2 Freely Extra Links,You Cand Adjust the Length Freely by Adding or Removing Them.Please Measure Your Wrist Size When You Make The Order. 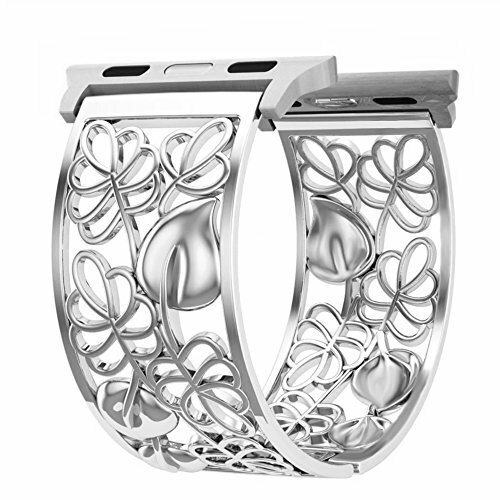 Convenient--The Floral iWatch Replacement Band Is Easy to Install and Remove,You Can Change Different Jewelry Replacement Strap from Time to Time. Ideal Gift Option--The Apple Watch Wrist Band Sport Strap Is A Perfect Present for Your Friends or Families. What is the iWatch Band for? Designed for Apple Watch,The Delicate Wriststrap Allow You to Personalize your iWatch with Different Outlookings,You Can Dress Fashion Watchbands According to Your Mood.Chresh Your Fashion Apple Watch Band,Enjoy Your Life. Adjustable iWatch Bands with Folding Clasp and Extra Links, for Simple Operation and Freely Length Adjustment, Fit Wrist Size 5.9" - 7.5" (150mm-197mm). Premium Metal Apple Watch Wrist Strap with Stainless Steel Adapter, Fixing iWatch Interface Precisely and Securely, Well Matched with Apple Watch Series 3, 2, 1, Sport, Nike+. 30 Days Money Back Guarantee, Return or Refund without Reasons.